It's exactly a decade now since I first tested an electric scooter. Back then, electric scooters were excruciatingly slow while charging infrastructure was a big question mark. Not much has changed in the past decade though, has it? Well, things certainly are about to change for the better, or so we're told by Ather Energy. Ather has just launched two 'smart' electric scooters in the country, the 340 and 450. 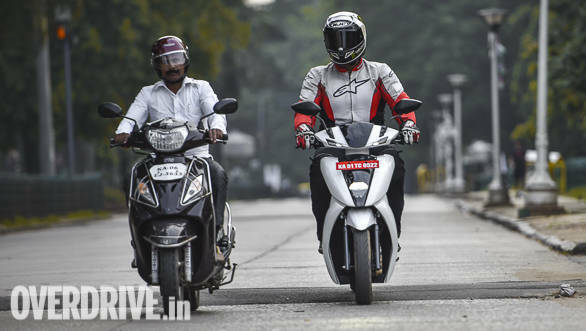 Both are identical, except for their power outputs, and we got a chance to ride the more powerful 450 in Bengaluru. So is the future electric? Read on to find out. 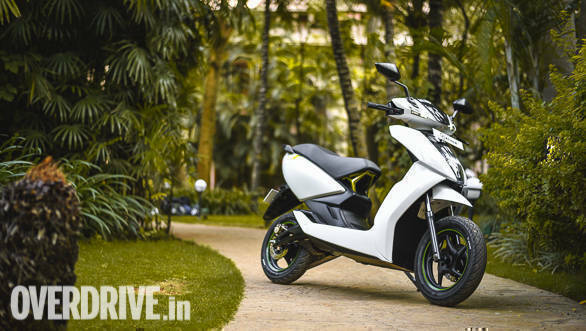 The Ather 450 is Ather Energy's first two-wheeler to say so. The company was formed in 2013 with the intent to produce batteries for EVs, before Tarun Mehta and Swapnil Jain, the co-founders decide to venture into building their own smart electric two-wheeler. The Ather 450 is thus a futuristic looking electric scooter that's powered by a brushless electric motor that draws power from a Lithium-ion battery pack mounted onto the floorboard. 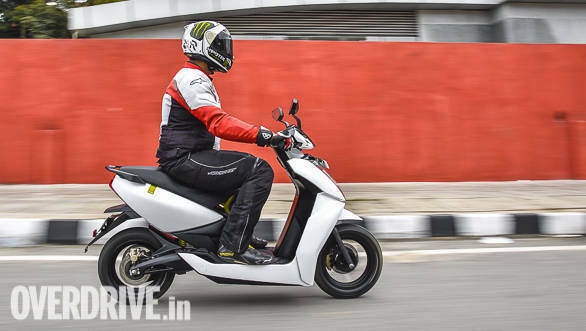 The 450's motor can offer up to 5.4kW of electric power which converts to 7.3PS, which is higher than most conventional scooters on sale in the country. 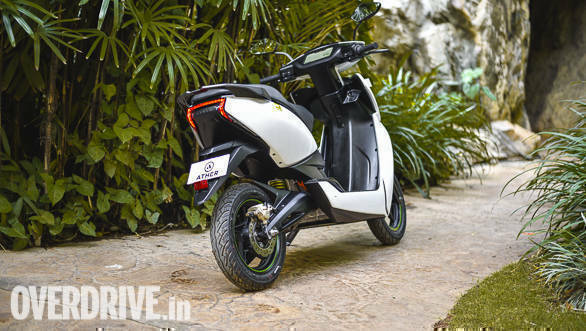 This means that the Ather 450 certainly addresses the lack of power on electric scooters, pretty much since time immemorial. The bigger shocker though is the Ather 450's torque output of 20.5Nm  that's higher than entry-level performance motorcycles like the KTM 200 Duke and Bajaj Pulsar 220, as both offer in the region of 19Nm! More on the performance later though, first let's take a look at the design. The Ather 450 looks highly futuristic  the sharp styling, all-LED headlights and carefully chosen white colour suggest as if it might just feature in the next Star Wars sequel. I really liked the green accents as well - the Ather badge on the sides, the seat hinge and green highlighting on the alloy wheels all look very appealing. Body panels have been designed to make for a highly athletic stance and the Ather 450 looks unlike any other scooter in the country. The side stand has been designed to sit flush with the body, while the battery pack is accommodated into the floorboard neatly  at first glance it is hard to tell there's a battery pack stashed in there as ground clearance is a decent 160mm. 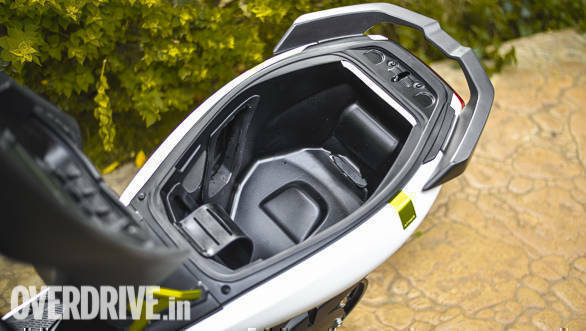 The seat is contoured to look sporty, while pillion footrests are designed in a way that the pillion's feet won't brush against the rider's legs even when the rider puts his feet down.The rear looks equally futuristic thanks to the design of the stop light and turn indicators, while green accents on the monoshock look nice. The design is neat and clean and if you were to not notice the absence of an engine and exhaust on the Ather 450, it is hard to tell the fact this isn't a conventional scooter. Interestingly, despite its compact dimensions the Ather 450 integrates what is one of the biggest underseat storages spaces and can hold a full-face helmet, apart from boasting a few smartly designed cubby holes. The compact dimensions might suggest otherwise, but the Ather 450 is accommodating and I did not find the scooter cramped despite my near six foot frame. To get going you do the usual  turn the key to on, press the rear brake lever and then the 'starter' switch. Of course there's no sound at standstill but when you twist the 'throttle' there's a little whirr, that's it. There's an eerie silence, which can be disconcerting initially. Open the throttle the scooter is quick to get off standstill and I have to admit, I was surprised at how quick the Ather 450 felt! 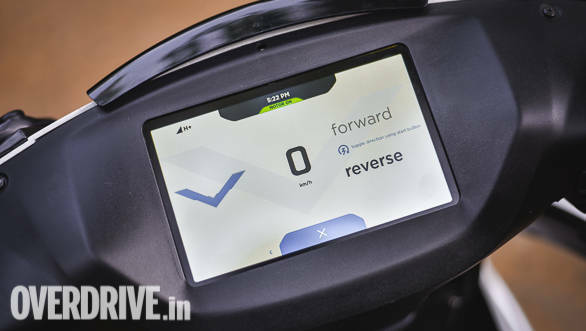 Ather Energy claims the 450 will accelerate to 40kmph from standstill in just 3.9 seconds, which is really impressive, and will certainly help in changing the way electric scooters are perceived in terms of acceleration. The bigger surprise though was how quickly the Ather 450 accelerated to a speedometer indicated 60kmph and continued accelerating beyond that! Claimed top speed (actual, we're told) is 80kmph, though the speedometer indicates is in excess of 90kmph. This is something unheard of for electric scooters in our country! 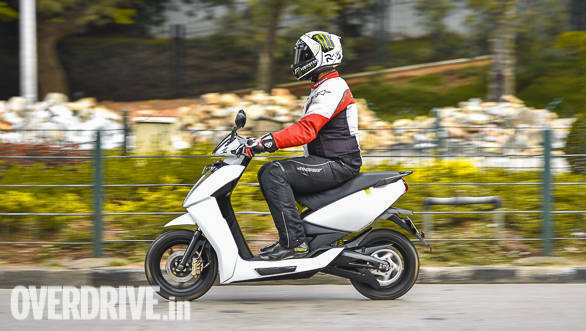 And given its kerb weight of 118kg, the Ather 450 is not significantly heavier than conventional scooters, considering most scooters weigh around 100-110kg. Credit for that also goes to the fact that except for the headstock, the entire chassis is made of aluminium which has helped in keeping the overall weight in check. The Ather 450 is suspended on telescopic forks upfront and a monoshock at the rear. It runs on 12-inch wheels shod with MRF tyres and its handling package is thus as impressive as its performance. It feels agile, especially when making quick directional changes in traffic  the nimbleness of the front end along with the feel and feedback over bumpy surfaces is impressive. Placing the battery pack on the floorboard (the battery pack weighs 19kg) has also helped in lowering the scooter's centre of gravity, which further aids handling, in conjunction with the well-engineered, all-aluminium trellis frame underneath the skin. There's a sense of surefootedness that had me ride the scooter enthusiastically and the Ather 450 only responded in a way that made me smile inside my helmet. Heck, here's a scooter that's breaking all my preconceived notions about what battery-powered two-wheelers are capable of! The Ather 450 also uses disc brakes at both ends  unheard of in our country on scooters, right? I am impressed with the braking prowess as well, and I'm not referring just to the bite. The front brakes offer really good feel and feedback, which adds to the engaging feel. The suspension setup is firm and when riding at slow speeds I could feel some of the bumps and potholes on Bengaluru's not-so-perfect roads, but the experience got better as speeds went up. The ride and handling package is thus neatly balanced and I'm sure that enthusiasts will appreciate the Ather 450's dynamics. What about the equipment, features and technology? This is a smart scooter - so you have a six-axis IMU (Inertial Measurement Unit) that works full-time to collect as much data as possible about the scooter's acceleration, speeds, lean angles and more! Isn't that something we've seen only on large capacity sportsbikes previously? Another favourite of mine is the touchscreen instrument cluster. This is in fact a 7-inch tablet which integrates a SIM card and is connected to the internet full-time. Goes without saying the touchscreen offers vital information like charge status, range, speedometer and the like, and also doubles up as the navigation screen. Lest I forget, like the battery pack and motor, the instrument cluster is water proof, so you need not worry about going out in the rains. Thanks to the display you have navigation displayed in a 'large-screen' format right in front of you on the go, which means the need to stop, pull-out your phone for directions has been eliminated completely. As a safety measure, the screen's touch function stops working beyond 5kmph, which is thoughtful. Another favourite of mine is reverse mode. Many might argue that you don't need reverse mode on a compact scooter like the 450, but having tried it, I can vouch for the fact that reverse mode isn't just convenient, it is fun too! You simply pull the rear brake lever and press the turn indicator switch along with the starter button to engage reverse (you can access it via the touchscreen too) and twist the throttle to go backwards. Speed for reverse is limited to 2kmph, for safety reasons obviously, and also to ensure people don't try to race backwards  seriously! There's a dedicated Ather app as well, which is your gateway to a host of functions and information  not just about the scooter but the Ather ecosystem as well. Ather Energy has also launched the Ather Grid, its own charging infrastructure. 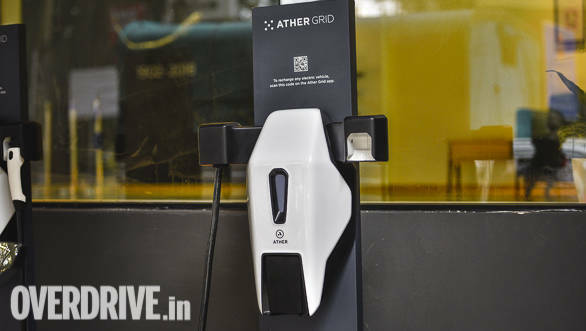 Ather is currently installing charging stations called 'Point' at various public locations in Bengaluru  the number will cross 30 by end of this month  where you can access fast charging. The app will give you information about the nearest charging station, navigate you there and also provide information about your subscription plan to Ather's service pack, called Ather One. Ather One is a subscription plan that can bought for Rs 9,912 for one year or Rs 2,596 for a quarter, for now. Monthly subscriptions start at Rs 700 per month effectively, which is a lot lower than what you would spend on fuel, just for commuting to work everyday. And for the price, you get access to a host of services, not to mention that many services you would pay for conventionally are effectively free here. That said, if you subscribe to the plan Ather Energy will pay you for the electricity you will use at your home to charge the scooter and also pay the hosts of its public charging stations when you charge your scooter at such locations. Effectively that translates to zero running costs  literally! Ather One also includes free servicing and maintenance and zero labour charges, and you also don't need to pay for consumables like brake pads. 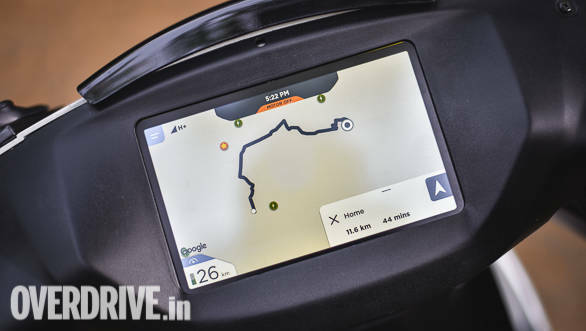 Apart from that, Ather One also includes free data services for the onboard navigation, diagnostics, over the air updates and more. Lastly, Ather One also includes charges for roadside assistance! That's quite something to offer as an annual maintenance package and certainly makes the deal sweeter. Well, if that's what you're thinking, because I haven't told you about the pricing yet. 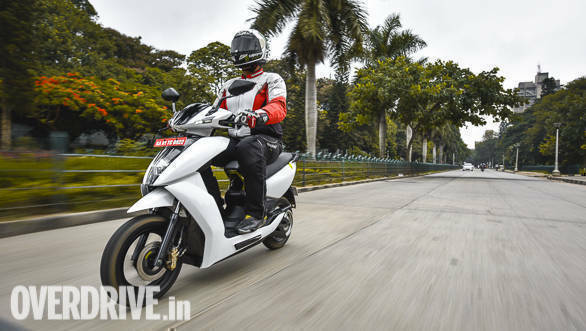 The Ather 450 is priced at Rs 1.24 lakh on-road. Stumped? It sounds like a lot of money  almost twice of what you would pay for a conventional scooter in fact. But there's no denying the fact that once you pay that price, you barely have to pay for anything, since the price of the scooter includes a free one year subscription to Ather One. The Ather 340, which offers slightly lesser power but gets the same features and functionalities, retails at Rs 1.09 lakh on-road. Once electric scooters get mainstream, it might just be the end of the road for conventional scooters! When talking EVs, I don't think anything is more important than the range the vehicle offers and the time it takes to charge. 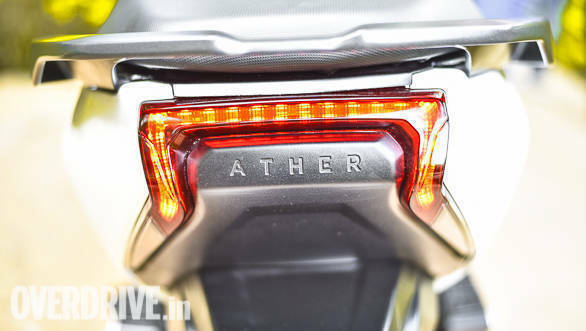 Ather Energy says the 450 will run for about 60km on a single charge in the real world, in performance mode that is. In Eco mode the scooter will manage a distance of about 75km on a single charge, which is enough for commuting to work for most people. The claimed range according to the Indian Driving Cycle though is 107km, which is pretty impressive considering the performance offered by the scooter. As for the charge time, a regular home charger can charge the battery pack fully in 4 hours and 18 minutes claims Ather Energy. Plugging into a fast charger or any of the Ather Grid public charging stations will offer fast charging at the rate of 1km/minute. An even more interesting fact about Ather Grid is that for the first six months, Ather and non-Ather owners of EVs can charge their vehicles absolutely free! Buying the Ather 340 or 450 though will ensure you don't have to pay even after that duration, considering Ather One covers that expense. There's no two ways about the fact that the Ather 450 is unlike any other scooter in the country. It looks very distinctive and is unique in almost every possible aspect. 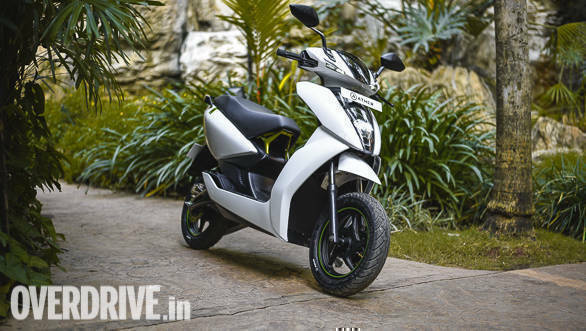 Given the performance it boasts, the Ather 450 will show a clean pair of heels to most conventional scooters in India, while also handling better than many of them. It will certainly help in changing the way electric scooters are perceived, though the bigger news is Ather Energy addressing the lack for charging infrastructure by creating one of its own, as charging stations have always been one of the biggest stumbling blocks when planning to buy an EV. The pricing is steep but one needs to understand that electric technology is in its early days even today and there's some time before we see them get mass produced to bring prices down. Given its pricing the Ather 450 (or the Ather 340) will probably only attract the attention of educated buyers wanting to experience a well-built electric scooter without worrying about its price, since it is out of reach of a major chunk of the population. But Ather Energy is clear that it isn't chasing volumes with its products and is keen on producing and offering high quality EVs that are fun to ride while also paving the way for electrification further. So yes, the future is certainly electric!